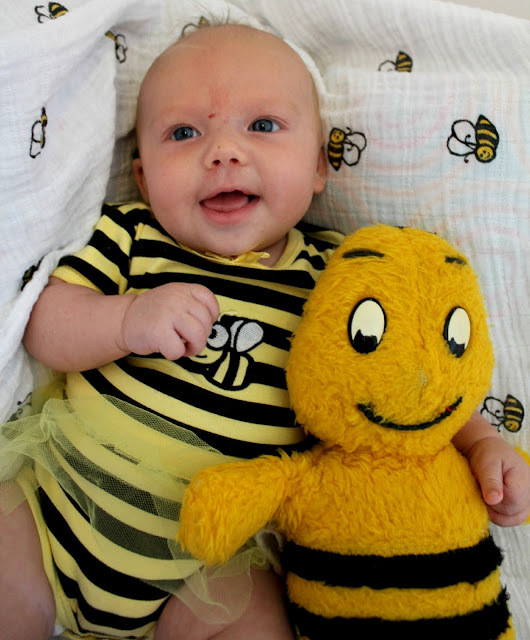 Two Loonies and a Penny: Happy 2 Months Penny! Who was I before Penny-kins? Or Pen-Pen as Mr.Loonie lovingly refers to her. It's funny...what nickname will stick with her as she grows older? What will her friends call her? "Pens" for short? P-ster? Penelope? Anyway.....I can't believe it has been a full two months already! I can't imagine my days without her smile or her snuggles. I know I better appreciate these newborn snuggles because I heard they do not last. Everyday is another day that she changes. In just two months she has grown 6 inches longer; that's like her whole head length! Last week I had to run down town and buy 0-3 month sleepers as she has outgrown the newborns. Not only is she longer, she is stronger! I am constantly working with her and encouraging her to work her little muscles. She loves standing and can bear her weight on her legs for at least a minute before her knees buckle and needs a break but she is right back up again shortly after. While standing, her head is up high and proud looking around but not long before it falls into a bob and weave. Her little neck has come a long way though, when she is over my shoulder her head is always up looking around and when in a sitting position she does her damnedest to sit up straight and hold her head still. 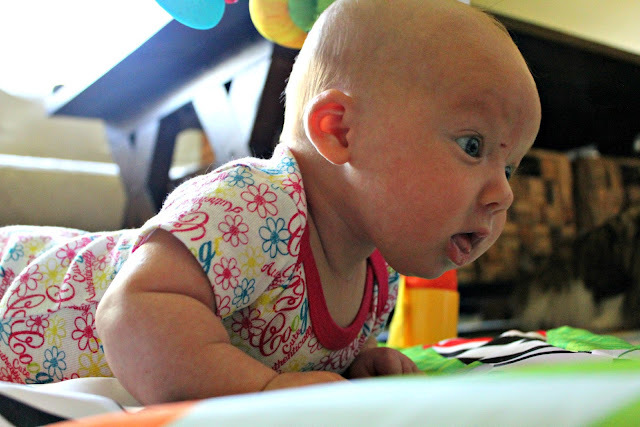 Although tummy time is not Penny's favorite, it is important. She spends a lot of the time face down crying into the mat out of frustration but I can see her determination to lift her head. The past couple of weeks, she can get her head up for probably around 30sec for a good look before she slams her little nose back down on the mat. Next step is the mini-push up and she is close, yesterday I saw her lift herself up on her elbows with her shoulders up off the mat. Once the mini-push up comes, we will be in the roll-over stage and that means no more leaving her on the couch and walking away!! The little milestones of her growth is so amazing! What I am really waiting for is to hear her little laugh?! My dad asked me today what I thought it would sound like. Will it be raspy? squeely? grunty? girly? I think it will be a cross between screaming and snorting! My mom just gave me an old ukulele she was planning on selling in a garage sale and I plan to learn how to play maybe a few nursery rhymes. Right now it doesn't matter cause Penny thinks I am a pretty good ukelelist already, she has been smiling away with some heavy breathing, almost snorting to the songs I have made up. Oh man, if someone could hear me.....embarrassing! For the first month or so I struggled to decipher her cries, was she hungry, tired, gassy, poopy, too cold, too hot, what was it?!? I just went down the list until she was satisfied. It was usually hungry or wet so things weren't that stressful but I was longing for the day where I could understand and help her a little quicker. Those days have finally come in the past couple of weeks which makes things a whole lot easier. Not only does Penny communicate with her cries but she is starting with the gurgles, coos and woos...so adorable. We have little conversations back and forth making eye contact almost the whole time with a few smiles mixed in. So on to feeding and sleeping. This past week marked a huge improvement in the sleeping department. My sleep deprived days are almost over, so to you new Moms out there, it does get better. Holy Hanna, I thought I would never know what sleep was again in the first month. It went from getting up very two hours to feed throughout the night and sometimes up for a couple hours at a time trying to get her back down. Then it went from every three hours to now four or five hours which is pretty bearable, actually it is awesome. We usually go to bed around 11pm then up between 3:30am and 4am for a quick feed and diaper change then back to bed to be up again around 8am. If we are being lazy, I can do another quick feed to go back to sleep till 10am. Pretty sweet right? I can no longer complain, I am sleeping longer now then I ever did working! On to breastfeeding.....all I can say is thank god I decided to nurse! It is so easy! I think because I had such a rough and long painful labour (I am still writing my birth story, will post it soon) I was blessed with the ease of nursing. It came natural for both Penny and I without any real complications or big learning curve. I am planning to write a post just on breastfeeding, although the actual feeding part has been easy the social part has not always been. I am also really looking forward to cloth diapering, the diapers I bought are good for 15-25lbs, so we are only a few pounds or months away. I went with 24 of the form fitted flannelette type which is worn along with the diaper cover (I bought 4 of these). The amount of garbage we have a week with the disposables is disgusting, not only are we throwing our money down the drain but we are contributing to the billions of diapers in landfills that will never bio-degrade! Also, I am sure Penny doesn't appreciate the diaper rash the chemicals are giving her. In the end $240 is more than worth avoiding all these things and all the extra work meaning endless laundry! So life with Penny is amazing but wow, what a change. Motherhood is something you can never really prepare yourself for, you kinda just need to jump in with both feet and hope for the best. Well really, it is try your best because although it has come pretty natural it is still a huge adjustment. My brain went from composing technical letters to the government and writing environmental reports to singing songs on the ukulele and having one sided conversations with a baby, a dog and a cat! For those who know me, please keep reminding me to get out and have a life outside my home! It will not only be important for me but for a healthy relationship with my daughter and hubby. Now for the cutest Penny-kins picture ever!! :) Our little bee with Mr.Loonie's honey bee ordered in the 1980's from the Honey Nut Cheerios box. Well, it's about time I meet this little girl and have a visit with you. Let's plan something, we'll message on fb?